Senator Jeff Sessions was confirmed as Attorney General, but not before Fauxahontas, prog-fascist heroine and the senior senator from Massachusetts made a particularly nasty attempt at impugning the reputation of a far more honest and accomplished human being than she'll ever be capable of becoming. How charming to quote Senator Ted Kennedy as a moral arbitrator, the man who left a woman die slowly in a car he crashed and then colluded with the authorities, using his name, position and influence to hide his part in it? The man who invented 'Borking,' the sport of demonizing and slandering public officials nominated for public office and up for Senate confirmation? The man who could justifiably have been prosecuted for treason because of his private approach to the Soviet Union offering to help them destroy the Reagan presidency? And how amusing to hear the senator who was employed by Harvard based on lies about her native American heritage and who actually voted to confirm corrupt racist hacks like Eric Holder and Loretta Lynch talk about racism! I'm hardly surprised to find that the late Senator Kennedy is Elizabeth Warren's idea of a hero, role model and moral arbiter. And Coretta Scott King? She had a right to her opinion, although there's zero evidence that the judge who broke the KKK in his home state of Alabama is a racist. The late Mrs. King's heavy involvement with the Democrat Party when she wrote that letter in 1986 might just have had something to do with her sentiments. In any event, this cynical use of that letter without a scrap of proof is a classic example of the sort of McCarthyism happily use whenever they can while squealing like pigs in a slaughterhouse whenever they feel they can get away with accusing others of it. Of course, someone with more honesty might have chosen to read this letter to the Senate, from someone who actually was directly involved in some of Judge Session's 'racism' Mrs. King mentioned in her letter, someone who had personal reasons to bear a grudge. But this wasn't about giving Jeff Sessions an honest appraisal. Notice to single young men. Avoid any interaction whatsoever with a female wearing something like this. Consider yourself warned!!! 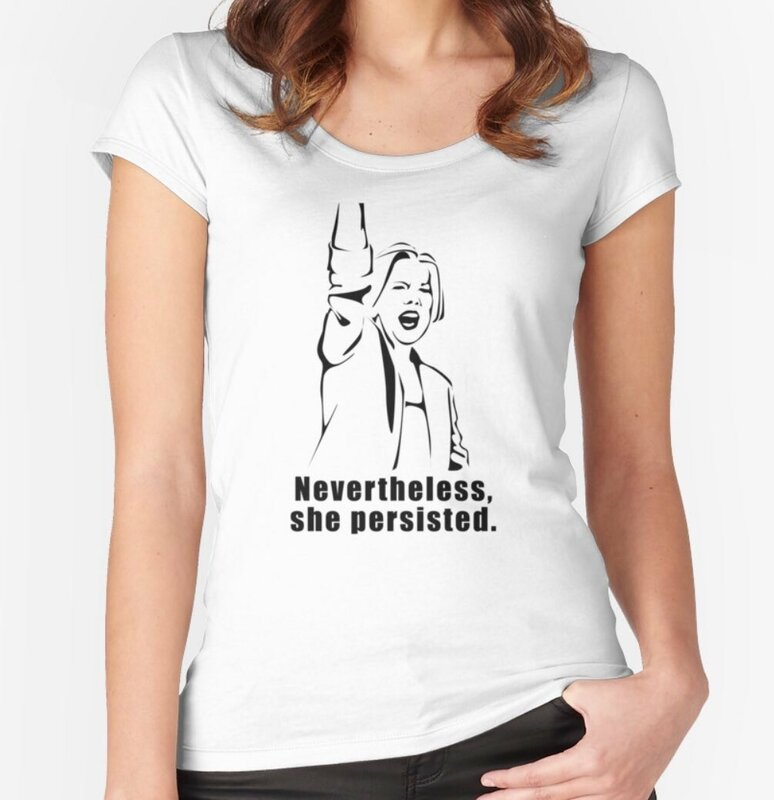 The unintentionally funny part of this is the 'she persisted' tagline. Fauxahontas didn't persist or accomplish a damned thing. She violated senate rules egregiously to help sell her book and herself as a possible 2020 candidate, was told by the president of the senate to sit down and keep quiet. She did as she was told. She didn't persist in keeping Jeff Sessions out of the Justice department either. There is something she did accomplish. Elizabeth Warren, just like the rest of the senate has worked with Senator Jeff Sessions for years. They knew very well the accusations made were libelous, partisan falsehoods. they did it anyway, just because. While the Senate was designed by our founders to be the deliberative, more reasoned, more collegial part of congress. The Democrats, led by Harry Reid have almost destroyed that completely. The crazed opposition to President Trump's appointees on the most far fetched grounds imaginable is unprecedented. Only one Democrat,Joe Manchin from West Virginia defied the baying jackals and voted to confirm his colleague. Do the Democrats imagine that after this, the Senate Republicans are going to be willing to work with them and pretend what Fauxahontas just did never happened? Do they really think th eAmerican people don't see what they're doing? You reap what you sow. Chuck Schumer, Elizabeth Warren and their colleagues are in for a hard lesson.